Feel like a boss? You will when you crack open our flagship West Coast Style IPA, Boss Pour. Waves of Pacific Northwest hops are supported by American 2-row and copious amounts of English speciality base malts. Bright citrus and a touch of dank hop characters are the ones in charge here, and will surely be good for the end if your daily grind. So step on up, be a Boss. Hops: Cascade, Simcoe, Nugget, Citra, and Mosaic. From: Bine & Vine Bottle Shop in Normal Heights (San Diego), Calif. There's no limit to the reach that the New England IPA as the trend now stretches from the Northeast to the West Coast. 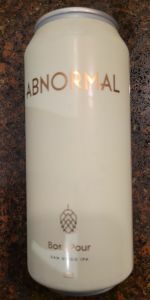 And with the use of Cascade, Citra, Simcoe, Mosaic and Nugget hop varieties, the IPA of Abnormal Beer is boss. Their Boss Pour comes with a pale goldenrod and densely hazed appearance that's off of turbid. A creamy and pillowy froth thwarts a reckless hop bouquet that starts off fruity and floral, but extends swiftly to citrus, herb, tropical fruit and melon. Firmly malted, the sweetness is soft with nutty cashew, toasty, honey-like and with a pep of butterscotch. Sweetness quickly dissolves on the tongue and the hops nestle up to the tastebuds that lead with pink grapefruit, lemon, mandarin orange and the light bitterness of lime. Tropical flavors ensue with pineapple, passionfruit, kiwi and light mango. Juicy throughout, a sense of creamsicle and honeydew round the middle palate before the taste deepens with the herbal nature of chive, fresh cut grass, geranium and hemp. Medium bodied throughout, the beer's smooth bitterness prevents any west coast type of dryness or the tight bitter grip the hop resins usually leave on the gullet. Silky and with a hint of vanilla and butterscotch once more, a minty aftertaste rolls gently into a medium long linger. Pours a hazy, golden color with a foamy, finger of head. Smells dank with some citrus and resin. Nice tropical fruit flavors, pine, grass, grapefruit rind, and a good amount of lasting bitterness. The sweet fruit flavors show a bit more as it warms which helps balance out the bitterness. It's medium bodied with a little creaminess in the texture. Thanks Con Fact! From the can, Boss Pour is a lively, bright, pale golden color with a foamy head. The nose is loaded with fruit, tropical notes, vegetal suggestions, and dankness. Medium-bodied with a crisp carbonation, This beer greets you with a big splash of citrus rind, orangey notes, salty suggestions, sticky resin, oily feel, and a dry, aspirin edge that rides into the finish. What I like most about this beer is that not only does it check all of the West Coast IPA boxes (bright, clean, hoppy AF), but it brings the dank along with delicious layers of raw, leafy, resiny, and hoppy goodness. And it does so like a—wait for it—freakin’ Boss. Sometimes basic is cool. Sometimes average ain’t that bad. Because when you try too hard and fail, you fail even harder. So children, if you want to succeed, listen to Raul: not everyone is David Beckham in a pair of Gucci skivvies. Realize that, and that you are the Joe Boxer wearer that you are. Oh, this is all because this beer is awesomely average. And Raul digs that. Another beer liberated from the demesne of California, USA. 16 oz. can. My luggage was 48 lbs. A wasted opportunity for another bomber. The pour is light nor’easter, very mildly hazed yellow, like the can minus the neon. The nose, it is lemon, kiwi, & citrus. Positive. Boss Pour stretches the IPA mold like a plate-sized head on a newborn. Or something. So lemony. Lemon with attendant bitterness dialed down a few notches, plus citrus, orange zest, grapefruit, it’s like a Magical Horn of Fruit. Dry. Like, desiccated corpse dry. Points for originality, this IPA falls into the solid category. Good beer. Appearance - Pours with a slight hazy and golden yellow in color with a white, white width head that fizzes away rather quickly, leaving behind a thin, broken layer of suds with a thin ring around the edge of the glass. Not much for lacing; just a small handful of spots. Smell - Orange, grapefruit, peach, crackery and lightly toasted bread malt aroma. Taste - Follows the nose. Citrusy and fruity hop flavor that evokes thoughts of zesty orange and grapefruit rind with slight pithy bitterness. Fair stonefruit and pine character as well. Malts ride beneath with lightly toasted bread. Finish is bittersweet, with a lot of the aforementioned flavors found lingering. Mouthfeel - Medium-bodied with a fair amount of bitey carbonation. Slick, easy drinker with a crisp, refreshing and lightly dry finish. Overall - A really tasty West Coast IPA that's held up well with just over 3 months of age on it. It really reminds me a lot of Aurora Hoppyalis. For the price I'd stick with the latter. 16oz can served in a pint glass. Dated 09/17/18. Given to me by @mr-jj. Pours clear, light yellow gold, small head, not much carbonation. Smell is pine and resin. Taste is pine, resin, with a little lemon and grapefruit citrus mixed in. Mouthfeel is light, crisp, dry, effervescent. Overall, very nice. Poured into a small pint glass. Pours a medium, quite hazy orange-gold with a half finger white head that dissipates slowly, leaving light lacing. Aroma of pale malt, pineapple, tropical and citrus hops, lemon citrus and mixed tropical fruit. Flavor is pale and lightly biscuit malt, tropical fruit and citrus hops, lemon, grapefruit, pineapple, light mixed tropical fruit; a mild caramel note leads into a resinous citrus hop finish with a little pine. Medium bodied with light creaminess and sharp carbonation. A great North East style IPA that has a typical tropical fruit forward aroma, but a more citrus dominated hop flavor. Good combination of fruit hop flavors and a satisfying deep hop bitterness in the finish. One of the NE style IPAs that kept my interest throughout the taste and glass. More hop bitterness than typical for the style and totally to my taste. So aromatic that my father asked me about it from across the room. Nicely done.